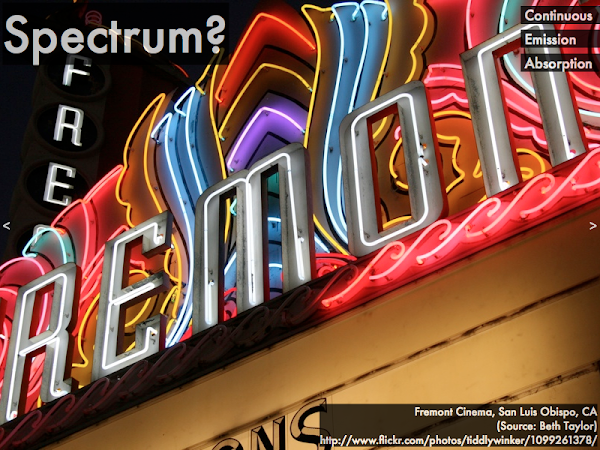 "That there are three different types of spectra! 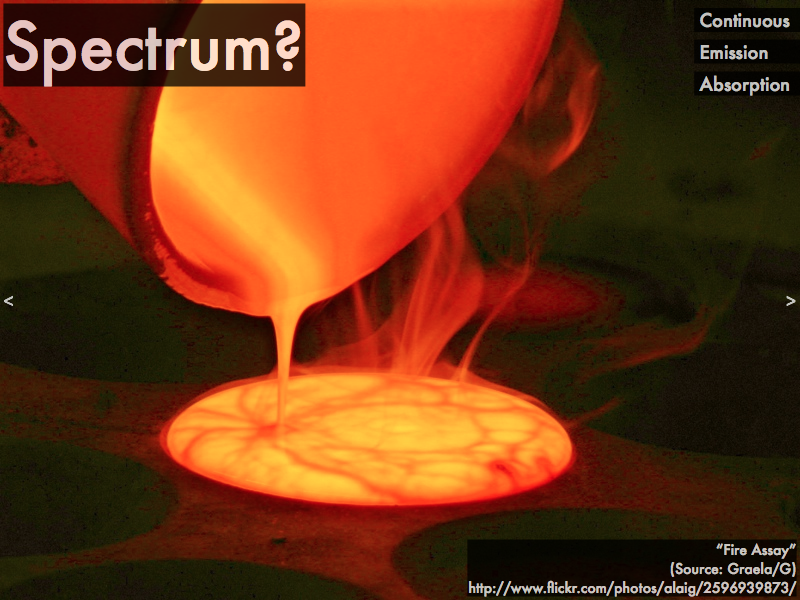 And how each type has a visibly different spectrum." 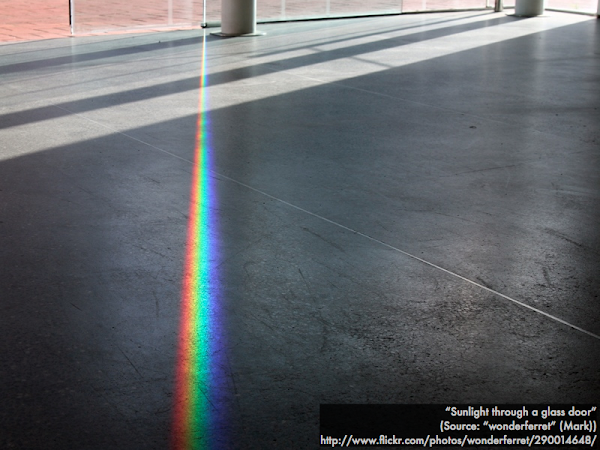 "That there are different ways of looking at and classifying light, i have never thought of it that way before." "Personally I found this entire section interesting. The light spectrum is something that seems difficult but once I read all the details in the book and presentation it makes so much sense. Especially when talking about fluorescent light bulbs." "I thought the Doppler effect with the car video was interesting. I've always known about the affect that the car horn would have on someone hearing when passing by but never knew the scientific reasoning." "The Doppler effect, it sounded interesting but I need more info." "Learning about the Doppler effect. It was interesting because I have never really given thought as to why travelling sounds do this, but now I have a better understanding." "How the pitch of sound coming from a moving object becomes squished and stretch and depending on what side of it you are on this will cause it to sound either higher or lower." "The Doppler effect, as the changing sound of the car moving towards or away from a person is observable and it can be applied to light from stars." "The Doppler effect, because I have experienced this 'phenomenon' and recognized it (particularly when ambulance sirens drive past me), but now I have a name for it." "I don't understand it enough to even know if anything was interesting." "I'm freaking swamped with midterms." "I am confused on how to match the spectras with the correct images. I found myself feeling like i was guessing. I don't know how to determine whether or not the pictures have bright lines on a dark background or dark lines on a rainbow background or if the image is rainbow. I need some more explanation on that." 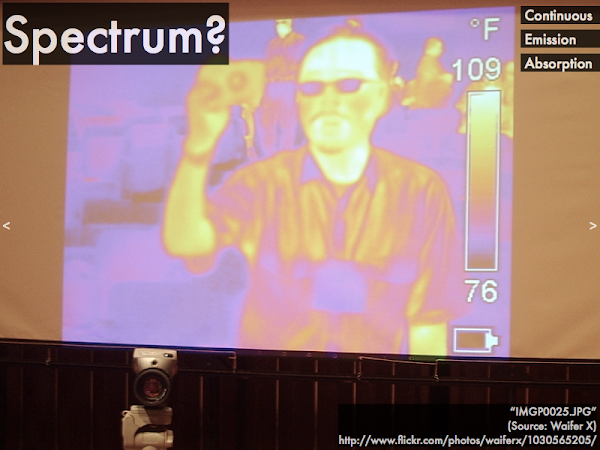 "It was difficult for me to gather what the different spectra were and how to ID them." "I'm confused about the formation of the spectra for no reason other than it doesn't make sense to me." "I'm still confused about how to identify the type of spectrum that a light source will produce and how to properly describe their characteristics. It's personally confusing to me because I am not familiar with this type of information. But I'm sure that it will become clearer to me after the in-class lecture." "Could we please review over the differences between absorption, emission and continuous rainbow? I am not sure if I understand it correctly." "The difference between squish and stretch in redshifts and blueshifts? I think I would need to hear and see you explain a lot of things in this presentation." "Everything. I didn't have time to do the homework this week, super busy." "I know why and agree why it's not a planet. However, I just personally want it to be a planet." "Pluto doesn't meet the new criteria for being a planet. It doesn't dominate its orbit." "I disagree because in order to be a planet it has to be round, dominate its orbit and revolve around the sun and Pluto doesn't dominate its own orbit and it doesn't revolve around the sun.Something to do with the size and having rings circle around it?" "Although I was raised to believe that our solar system consisted of nine main planets, I’m not too affected by it not being considered one now." "I could go either way. I acknowledge its contribution to knowledge we have gained from it over time. I also understand it technically does not qualify to be a planet according to today's standards!" "I know it doesn't dominate it's orbit but at the same time it orbits the sun and is round." "Because after learning about dwarf planets, I believe Pluto should be a dwarf planet." "Pluto is a dwarf planet with a much different density making it not the same as the other planets." "Pluto used to be a planet, therefore it should remain one.."
"Because then we wouldn't have just Pluto we would have to then consider like 500 other pluto-like planets." "Because it doesn't meet the planetary standards." "Nostalgically, I want it to be a planet, but it just isn't. It doesn't meet the qualifications." "Although I understand the reasons behind taking the title away from Pluto, I still think they should have at least given it a better title other than dwarf planet." "I believe Pluto should be considered a dwarf planet instead because it meets all the planet criteria besides dominating its own orbit. It should be a dwarf planet but not a regular planet." "I don't believe that Pluto should be a planet because I surrender to the authority of the IAU, who state that Pluto does not meet the criteria required to be regarded as a planet due to the fact that it is not large enough to dominate it's orbit or clear it gravitationally." "Pluto was a planet when I was a kid and I like continuity. I get the very real reason it isn't a planet because it doesn't own its orbit but still..."
"I put down 'disagree' only because I feel bad for it, but the truth is, it is not a plant, it's a dwarf planet! this is because is does not dominate its orbit." "Unfortunately for Pluto, as it doesn't dominate its own orbit it's really unfair to refer to it as a legitimate planet.."
"Nothing has changed in regards to the classifications of a planet. Pluto still does not dominate its own orbit. Sorry Pluto, start dominating and we'll reconsider." "Pluto shares its orbit with several other similar planet like masses and one of the criteria to be a planet is to have ones own orbit." "I think that your explanation on Pluto not being a planet resonated with me but I also wouldn't mind if one day Pluto was considered a planet again." "Because Pluto dose not fit the criteria of being a planet." "Pluto should not be a planet, because it does not dominate its orbit. It should instead be a dwarf planet." "Yikes. I haven't had time to read yet this week and was planning to do so before class tomorrow. I now see that it will be a doozy." "Even after doing the assigned reading of the textbook and lecture slides I am struggling with the spectrum assignment portion of this survey, which I know will end up being an in-class activity. I know it can't be THAT confusing, so I think I'm just not quite grasping a thing or two." "I wish that this section had more pictures that were used for examples of what emission, continuous, and absorption spectra look like in real life because what we were given is just making me a bit confused." 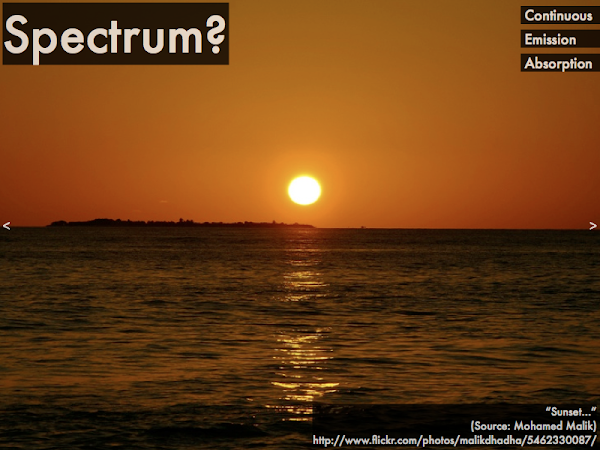 "How do we account for the Doppler effect when viewing absorption spectra?" "I love Lord of the Rings."